What Can We Do Together? 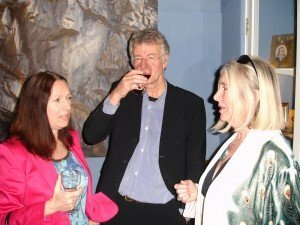 Just back from Grasmere, where Amanda and I went for the opening of the exhibition ‘Alfred Heaton Cooper (1863-1929): A Painter’s Journey’ at the Heaton Cooper Studio. A. Heaton Cooper was a fine painter in both watercolour (where his work has something in common with Turner and Ruskin) and in oils (where he approaches Post-Impressionism). 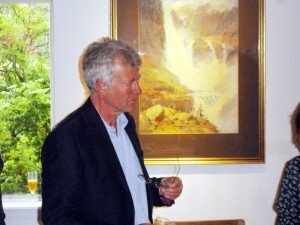 He had a wonderful sense of colour and light, and was devoted to the landscapes of both Norway and the Lake District. 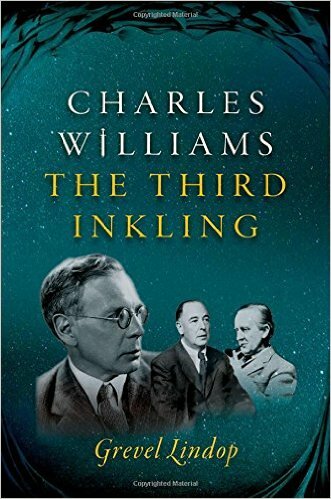 But he was also an excellent, lively and tender portrayer of people. He came from a poor background in Bolton, and made his own way and supported his family entirely by his own work. And he was the found of the Heaton Cooper dynasty – including his son W. Heaton Cooper, who illustrated so many classic books about the Lakes and whose watercolour landscapes are still hugely popular (though a bit bland for my taste) and grandson Julian Cooper, the adventurous and innovative painter of mountain forms and textures in Cumbria, the Himalayas, the Andes and elsewhere. 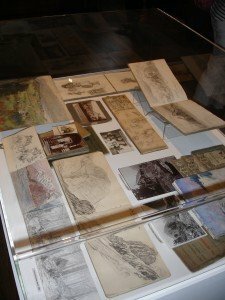 ‘A Painter’s Journey’, mounted to mark Alfred’s 150th birthday, is a splendid show: one wall is full of his Lakeland work, the other of his Norwegian paintings, and there are fascinating displays of sketchbooks and photographs. The sketchbooks are a particular delight, offering spontaneous drawings of people and turn-of-the-century landscapes, including a wonderful, graphic and rapidly-sketched panorama of a charcoal-burners’ camp in the Westmoreland woods. We met lots of old friends there: not only Julian and his wife, painter Linda Ryle, but also Angela Locke, the Cumbrian poet and novelist with whom I’m setting up Lakeland Writing Retreats, where from next May we’ll be offering creative writing courses in the Lakes. 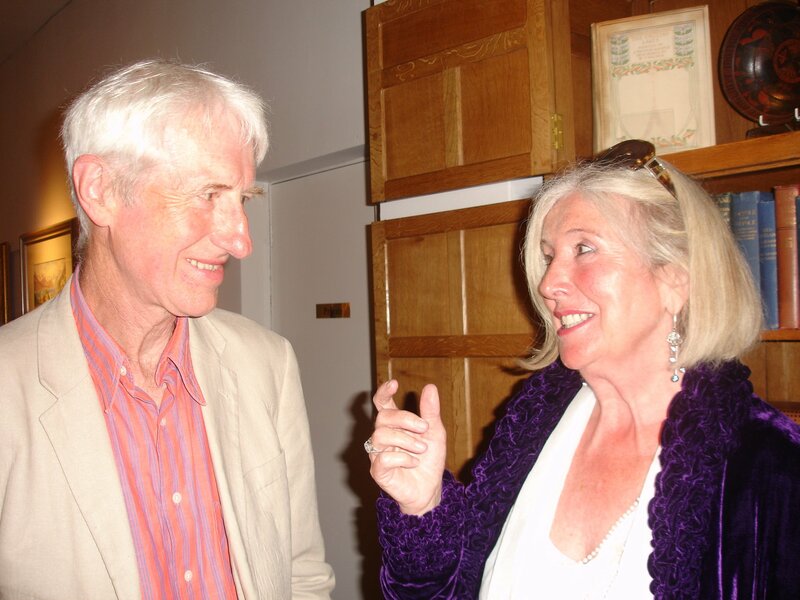 It was good to see novelist Chris Burns there too. Altogether a very happy occasion, and the next day we managed to get a good walk up to Easedale Tarn in cool but pleasant weather. 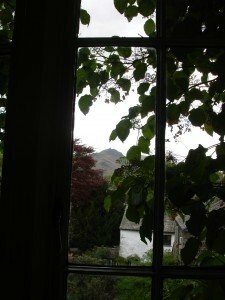 If you can get to Grasmere before 3 November, when the exhibition closes, do go and see it. It’s a very intimate and inspiring display of work by an underrated artist who is also an important part of Lakeland history. Back to the Lakes last week to give a talk to a group of Swiss students, mostly MA students studying English Romanticism. After a great day touring Dove Cottage and walking up Sour Milk Gill to Easedale Tarn I stayed on and went for a scramble around the slopes of Castle Crag near Keswick. The Crag doesn’t look huge from the Grange-Seatoller path but it’s really a ridge, much larger and more intricate than it looks, full of gulleys, crags, fissures and caves. Its slopes on the east side are thickly forested and you can disappear in there for hours and get happily lost. You can spend hours and days exploring its mysteries. I took a long time trying to locate Millican Dalton’s cave but didn’t succeed. I’ve tried and failed before. If anyone out there can give me precise directions to find it, please get in touch. I spent a while meditating in a grassy natural balcony half way up one of the crags and became aware of rapid zig-zaggy movements in a nearby tree. 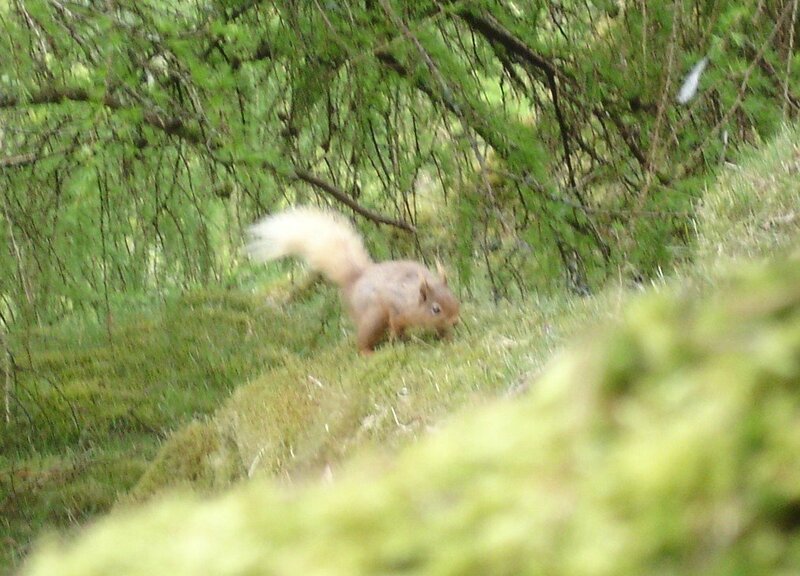 Turning gently that way I soon saw a pair of red squirrels chasing each other madly in a pine tree, tearing in spiral paths up and down the trunk. Managed to ease the camera out and when they finally tired of the game one of them ambled over towards me. This was about its closest point. 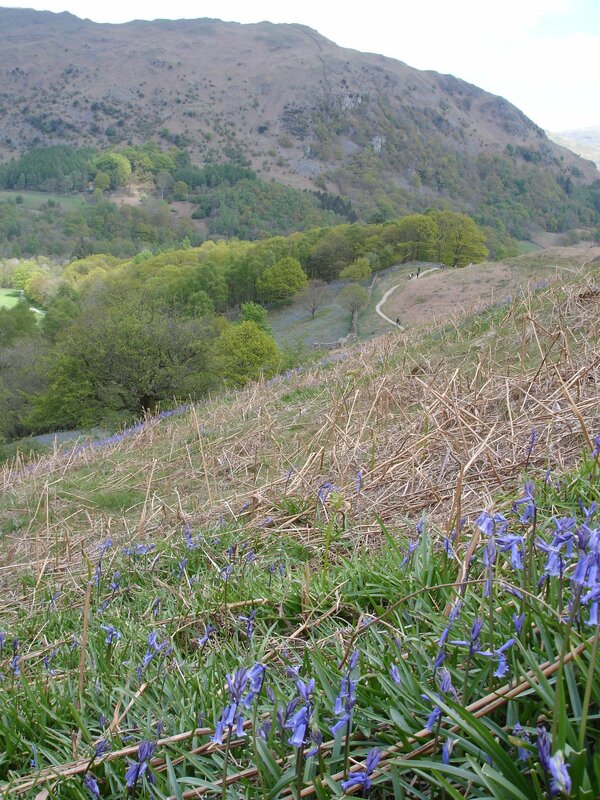 The weather was kind and we had a few great walks, including the circuit around Grasmere and Rydal Water. 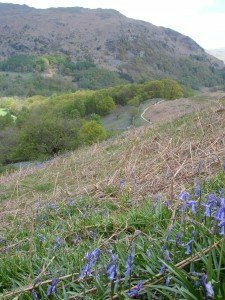 Sheets of bluebells were still floating their intense colour on the slopes of Loughrigg, making a wonderful contrast with the dead russet of the bracken. 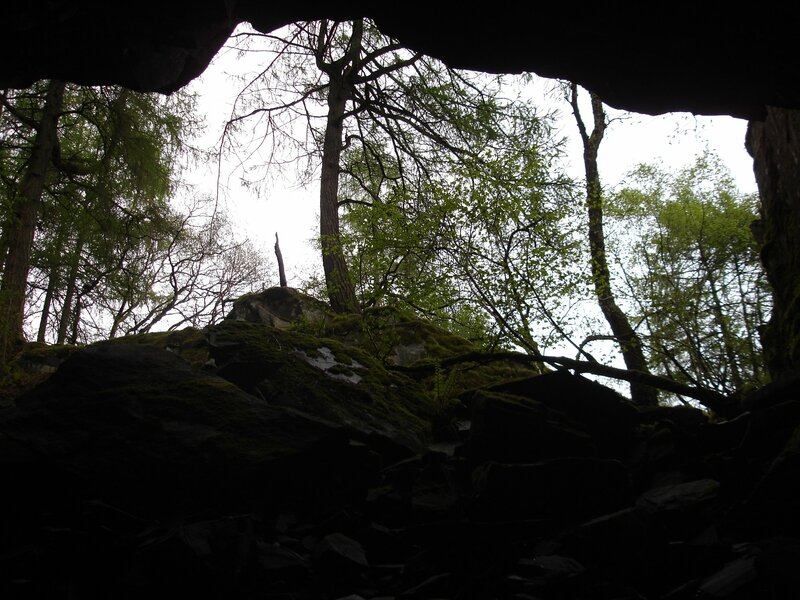 At the Rydal Cavern I disregarded the National Trust’s warning notice (what are the odds, really, of a chunk of rock dropping from the roof exactly at the moment I’m standing directly underneath?) 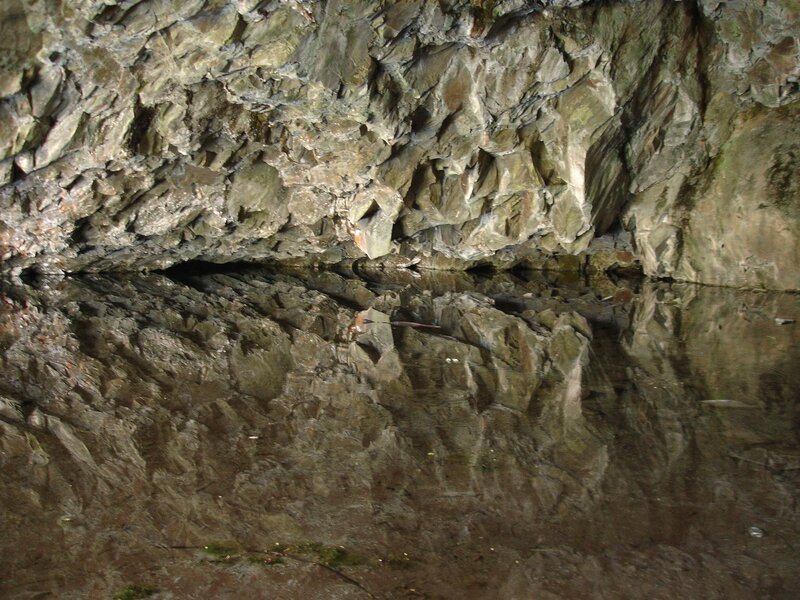 to go into this, one of my favourite spaces, and contemplate the mirrorimage of the hewn rock in the still floodwater. Of course I advise you not to do this, and if you go in there it’s at your own risk. Don’t sue me if you get flattened. While we’re all buried in snow, let’s catch up on some of the things I’ve wanted to write about while my internet connection has been down! First place definitely goes to ‘Mother Lode’, the magnificent exhibition of landscape paintings by Julian Cooper, currently showing at Brantwood, Ruskin’s house overlooking Coniston Water in Cumbria. No chance of getting there through the snow at present, but I’d very strongly recommend a visit once the roads are clear. Julian Cooper is probably Britain’s most original and accomplished landscape painter. 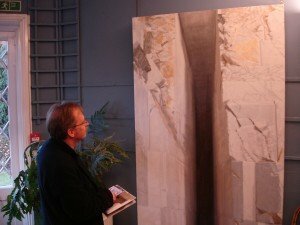 His particular interest is in mountains and rock surfaces (naturally enough, since he’s a keen climber), and over recent years he has developed increasingly brilliant and intense techniques for painting the patterns, textures and – if I can put it like this – the meanings of rock, the way it communicates itself to the hand, the eye and the memory. From open-air painting in the high Andes, he moved on in the 1990s to superb semi-abstract and highly-textured paintings of the Himalayas, often focusing not on the summits and profiles of mountains (which have been endlessly explored by previous artists) but rather on rock and snow faces, their textures, patterning and forms. 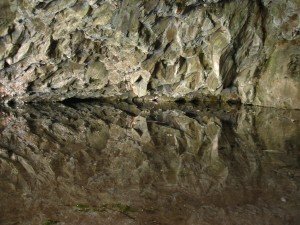 He’s now taken this a step further, to paint industrially-worked rockfaces which are literally the interface between man and nature. 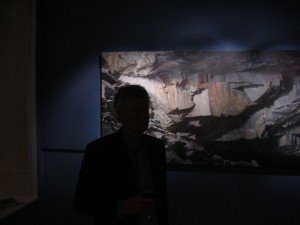 The Brantwood exhibition shows paintings from two such arenas: Cumbrian slate quarries from the Langdale and Coniston areas, and the Carrara marble quarries – the historic quarries from which Michelangelo took his marble and which are now quarried on a terrifyingly industrial scale. Julian’s paintings are exhilarating and massively impressive. 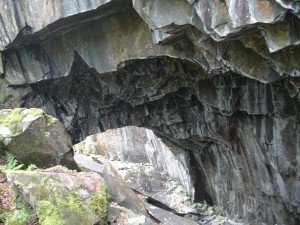 No one has ever painted rock like this before: the huge clefts and portals of vast stained marble surfaces, dwarfing tiny, insect-like industrial plant; the angled, many-coloured slate blocks, with angular light from a cave-mouth dripping over them. Julian’s work can look like realism, but compare it to any photograph and you see a miraculous added depth, an extra dimension of radiant experience. Looking at ‘Sawyers Wood’for example I can feel my own lifetime’s experience of scrambling around in and on such places, somehow embodied and singing out from the canvas. The rock in these pictures speaks to us in its own strange language and asks us what we’re making of it – sensuously, industrially, envrionmentally. It has an ominous and seductive beauty. 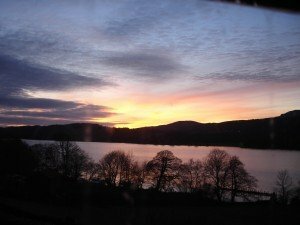 This is a whole new take on landscape and if you love the Lakes, or nature, or painting, you should go over to Brantwood as soon as the snow clears and enjoy some of the best landscape painting of our time. 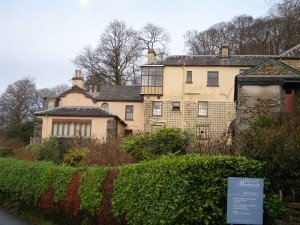 Not to mention Brantwood’s excellent restaurant, and the fascinating memorabilia of Ruskin himself, the great Victorian artist, social activist, prophet of climate change and a deep thinker about the interconnections between geology and art.